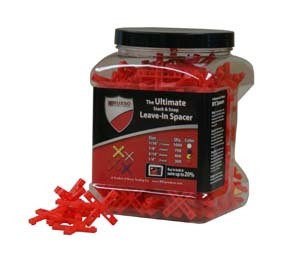 Buy online and get best deals on tile spacers for leveling tile wedge flooring at Tile Pro Depot. Shop Now! Using tile leveling spacers is an important part of installing tile—without tile being equidistant from one another, the overall installation will look shoddy and uneven. Spacers for tile flooring allow the tile installation specialist to place tiles and ensure they are correctly placed while the mortar sets, and before applying grout. They also determine the width of the grout lines in the installation. 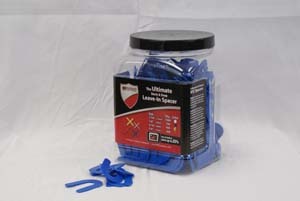 The range of tile leveling spacer size available is typically 1/16 to 1/2 inch and the experts at Tile Pro Depot recommend determining the sized use on a case-by-case basis. The size of the grout line and spacers for tile flooring used usually depend on the size and shape of the tile. For regular format tiles—usually 8 inches by 8 inches—1/8-inch spacers are recommended. This is a typical size for tile and grout lines in flooring installations, but 3/16-inch spacers could be used per request of the client. For larger tiles, a larger spacer is usually required. For any square or rectangular tile format larger than 12 by 12 inches, a 1/2-inch grout line should be used. With larger tiles, any irregularities in the edge of the tiles will be obvious with a smaller grout line. 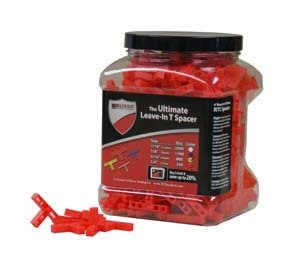 Large tile leveling spacers should be paired with tile leveling spacers to prevent lippage that can occur in tiles 12 by 12 inches and larger. It’s important here to remember that large tiles are more susceptible to lippage when the installation is done. Using a tile leveling system is crucial to preventing uneven floors, an overall terrible installation, and an unhappy customer. Like with large tiles, irregularly-shaped tiles, such as natural stone or ceramic, should have a wider grout line to better accent the unusual shapes of the tile. Create the accenting grout lines with larger tile leveling spacers for tiles that are uniform in their shape and make a pattern and also with tiles that have multiple shapes and sizes. In both of these cases, 1/2-inch tile spacers should do the trick. For square and rectangular tile, the spacers for floor tiling once against depend on the size of the tile. But if an installation is using a mixture of both square and rectangular shapes, then a tile leveling spacers size of about 3/16 inch to 1/8 inch is recommended to draw the eye to the differing shapes and sizes of the tile flooring. If you have questions or concerns about choosing the correct size for tile leveling spacers for tile flooring, contact the Tile Pro Depot for the expertise of tile installation professionals. We’re here to provide top-quality tile installation products and installation advice. Call us or fill out our online contact form for more information about tile leveling spacers for flooring.